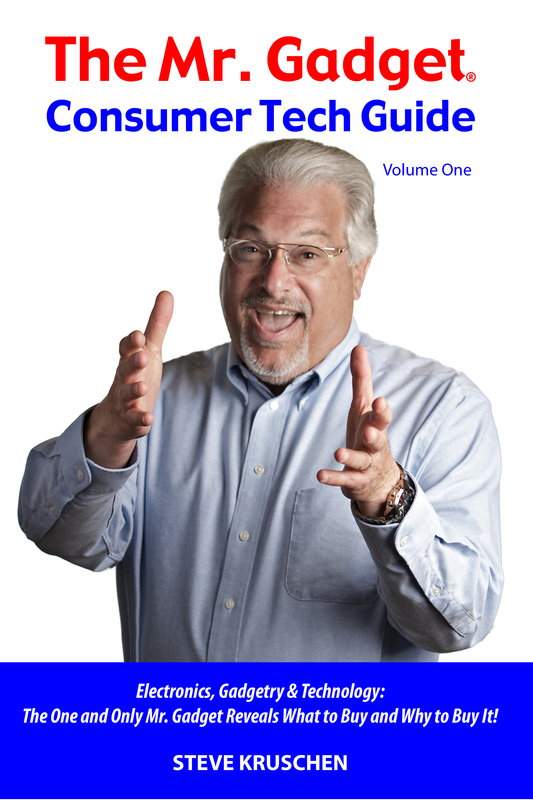 Posted on March 12, 2014 by Steve Kruschen, "Mr. Gadget®"
Read the how and why about this list from the top of the #10 post, then come back to read about The Cheese Knife. That’s right, this is THE Cheese Knife, not A cheese knife. You know how slicing all but the hardest cheese often sticks to an ordinary knife and to an ordinary “cheese knife?” The Cheese Knife changes everything, and not just for cheese. For butter, boiled eggs, cake and any substance that typically sticks to or leaves a heavy residue on ordinary blades. Made in the USA and dishwasher safe, its unique design by an engineer developer of WWII military devices is created from a special, heat-resistant material called ULTEM® Resin. And oh, how well it does its job! For most everyone, using The Cheese Knife will be a transformative experience, one of those, “Why didn’t I get one of these a long time ago?” occurrences. I’ve seen it happen over and over again, and it never gets old. Observe the stepped-side patented design the company calls a “drafted blade,” which is also thicker at the top than at the bottom, the cutting edge. The Cheese Knife is also fun to use. Slice thick or very thin more easily than ever before, and without the cheese sticking to the blade. The handle has a soft grip, is comfortable to hold and to put in action. The “original” version’s blade measures a just right 3.75 inches. The large version sports a 7.25-inch blade. Not content to produce the basic model, I also use and recommend their serrated edition, which I find most useful as a bread knife. Some users favor it to slice tomatoes, as a salad knife and as cake knife. Why plastic and not metal for a bread knife? Some serrated bread knife edges are somewhat delicate, with sharpness difficult to maintain as new and even more difficult to re-sharpen. The Cheese Knife, in its large, uniquely serrated form does the job so well. I’ve yet to dull one, but if it goes beyond its serviceable life at some time in the distant future, I’ll simply replace it less expensively than a piece of fine cutlery. Make no mistake, the blades can cut the skin, especially the jagged serrated edge, though neither are “carving” knives. Always exercise caution during handling. 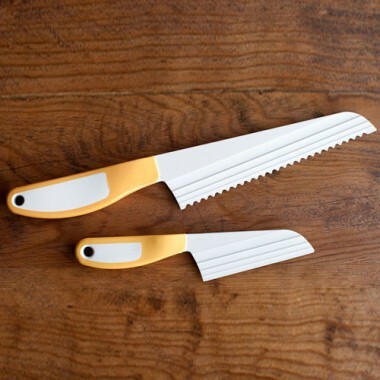 Get a multi-pack of one Original (small) and one Large yellow-handled serrated The Cheese Knife for $36. Separately, the Original is available for $16 with original (yellow), black and red handles. Large plain and serrated knives sell for $22 each with either black or yellow handles. www.TheCheeseKnife.com.